Winner, One Real Cowboy! Last Call. Naked, noble and irresistible--who could resist one of Sally MacKenzie's heroes? Sally is going to be giving away a signed copy of The Naked Earl to one lucky poster, and the Hoydens are going to be giving away a full set of the “Naked” books (that’s right, we’ve got copies of Duke and Marquis!) to a poster who’s certain to become a new fan. Be sure to let us know when you post if you’re new to Sally’s books, or a long time fan, so we’ll know which drawing to put you in! The Naked Earl is set in Regency England. How did you become interested in this time period? What you love about it? Sometimes I get frustrated when I come up with the perfect expression or image and realize I can’t use it because the word or concept hadn’t yet been invented. And the other thing that sometimes frustrates me--shh, don’t tell anyone!--is the hot breath of the Regency Police breathing down my neck. (Is it okay to say that on a blog called History Hoydens? Just put me on the “hoydens” side of the title.) I do want to get things right…well, more, I don’t want to get things wrong…and I do worry about making a major booboo. But I’m not an historical purist. I’m writing fiction--not history--for 21st century readers. So my heroines are usually virgins, but they’ll call their hero by his first name--at least by the time they fall into bed with him. Sadly, writing has spoiled the reading experience for me, though I’m hopeful this will change over time. Now I just can’t turn off the editor/proofreader. I do better when I don’t read historicals. I just finished judging my Rita books and was happy to find a romantic suspense and a paranormal I enjoyed. Definitely a pantser, which, frankly, surprises me. (My kids will tell you I’m a bit of a control freak.) Since my books are connected, I usually know who the story is about a book or two in advance, I just don’t know what the story is. When it comes time to write, I have to think about these people, who they are, what they want. I’ll often have a scene or two I know I want to include--it might be a pivotal scene, but more often than not it’s just a funny scene--and then I put the characters together and see what they do. It’s fun, when it’s not nerve wracking. I do edit as I go--I am a freak about word choice and sentence structure--but I also edit again once the book is finished. I like to allow at least a month between typing “the end” and handing in the manuscript to go through the story, tweaking, polishing, making it as perfect as I can. By the time I send it to my editor, I feel it’s finished--and so far, I’ve only had minimal changes in my copy edits. But by the time I get the copy edits, I’ve gotten some distance on the story, so I have changes of my own to make. I try to restrain myself when the page proofs arrive, though. I edited the college magazine when I was a student, and it was very firmly impressed upon me that by the time the manuscript reaches this stage, changes cost money! As I said, my books are connected, though all can be read independently, of course. In my debut novel, The Naked Duke, I introduced three male friends--the Duke of Alvord (the naked one), Captain Charles Draysmith, and the Earl of Westbrooke. Alvord’s sister, Lady Elizabeth, has had a crush on Westbrooke since she was a girl. The reader sees it in the Duke and in my second book, The Naked Marquis, though Westbrooke appears clueless. Finally in The Naked Earl these two get their story. No, no major research for this book. It’s a “house party” story--lots of bedroom high jinks. I did begin my descent into garden hell, though. Miss Meg Peterson, who is the heroine of my fourth book, is very much into plants and garden design. I wouldn’t know a rhodedendron if it bit me in the derriere--well, I’d probably have a sneezing fit--so learning enough about vegetative matters to lie convincingly was a stretch. The Naked Earl is part of your series of Naked Men (The Naked Duke, The Naked Marquis) Any more naked men to come? The Naked Gentleman is scheduled for May 2008. It’s the aforementioned Meg Peterson’s story. And I’ve just accepted a contract to write three more books, so I think I can safely say there are more Naked men in my future. Do you see yourself forging on to a new era when you’ve run out of Naked Men? Thanks for "chatting" with us, Sally! Hi and welcome Sally. I have never heard of you before today but I must say that I am wanting to meet your men especially after reading the following:'Naked, noble and irresistible--who could resist one of Sally MacKenzie's heroes?' I was taken after the naked, lol. Noble and irresistible has it's benefits also. Thank you, Sally, for writing such fun books with irascible heroines and the men who get naked with them! I'm brand new to the blog and to Sally and her books - they sound like wonderful fun - but I'm certainly going to be hanging around in the future. And on the look out for Sally's books. Ok, I've seen her titles all over the place, but haven't read any yet. Which is just sad and wrong. And I love Sally's philosophy on historical accuracy. The research is addictive, but I'm not wanting a textbook when I read. . . I haven't read any of Sally's books. They sound really great and I'm sure I would love them! I've always enjoyed reading stories set in Regency England. Oooo, new readers!! Love it, love it, love it! Great interview! I love the Naked books and highly recommend them!! I haven't had a chance to read any of your stories, but they all sound so good! Congratulations on the new contract! I enjoyed reading all your answers. Congrats on bestsellerdom, Sally! That's amazing! Chuckled at your comment about the Regency police. I think someone made a great point when he said that one poor author can never win the battle against her entire readership's collective knowledge! I can't wait to get my copy of The Naked Earl. Lost The Naked Duke on a Delta flight somewhere over the U.S. (so if you're looking for naked royalty...). Have read The Naked Marquis so many times the pages are falling out. Keeping checking the bookstores for The Naked Earl but alas, not there yet. Oh, for you ladies on the fence about buying any of The Naked series. I liked The Naked Marquis so much I went into a bookstore and hand sold it. I considered it a public service for other romance readers. Congratulations! 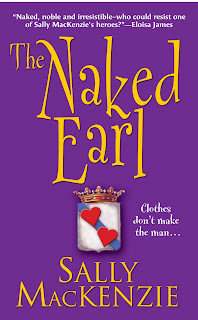 I love the Naked books and am really looking forward to The Naked Earl. One question: Will Meg's Naked hero be introduced in this book? The Naked Alien :) You had me there, Sally. I've not read any of your books yet, but am dying to start on the earl. You're right: Who can resist a fit good-looking naked man???? I work as an editor and proofreader, so when I read for pleasure, I try very hard to stay away from pens and pencils, because once I start in, I find tiny-tiny errors everywhere and that takes away the fun of reading. Hi, Christine! Does everyone here know that Christine has a book coming out in September from Berkley Sensation? Lucky me got to read an advance copy!! It's called Scandal's Daughter. Do look for it! Kathrynn, lois, jennifer, kimber--so glad you liked the Naked guys. And kimber, you are a GODDESS for hand selling the Marquis. I do so hope you like the Earl! Its official release date is April 3, so perhaps it will be in your neighborhood soon. jackietoo, I'm so glad you've enjoyed the Naked guys--and yes, Meg's hero IS introduced in the Earl. LOL, Keira. I have a strong proofreading streak, too, and have a really hard time turning it off to read for pleasure. On the way home from Boston yesterday, I was catching up on some letters from a friend--and cringing at the various grammatical errors that most normal people wouldn't notice. I don't usually read my own books once they are published--until I have to look something up to be sure it's consistent in a subsequent book--because I'm afraid I will find things that slipped by me. Actually, I'm getting ready to start writing The Naked Baron! I seeded two sets of characters in The Naked Gentleman in the event that my publisher wanted more Naked men. After the Baron comes The Naked Viscount. And then I have to think. I do believe having a Naked Baron and a Naked Baronet would just be TOO confusing, don't you agree?? I've been voting for THE NAKED VICER, but Sally isn’t going for it . . . LOL! I like THE NAKED NIGHT, too. Congratulations Sally on your newest book. I read the last one, I believe it is The Naked Marquis and I enjoyed it very much. Hi Sally, I enjoyed this informative and fascinating inerview. The characters are appealing and unique. Love your heroes. I have enjoyed your books and this interview ha provided me with a great deal of thought. Love all the heroes. I have so much pleasure from the Naked Books. Wonderful and entertaining. Loved this interview. Your novels are the most enjoyable ever. Love the Naked Heroes and look forward to more of these great books. Never enough of the Naked Heroes. So much fun to read. Best on your next novel. Sally!!! I hope I haven't missed you. Had to get something unexpected to my editor quickly. . . You know how it goes! I'm right there with you on the Regency Police. Which is why I chose the Victorian period. *g* Kalen keeps trying to get me to join the Beau Monde, and I want to. I'm just scared! I don't want to see what they have to say about my books! Eek! Good to have you here, Sally. I love Naked heroes!!!! Your interview was great and I learned a great deal about your writing. What great novels which I love and will continue to enjoy. And welcome, Kerry! Great to have you here! Wonderful interview. Thanks for all the insights into your great books. Loved The Naked hero books. They are the ultimate enjoyment. Hi, everyone, and thanks for all the comments! I'm so glad you enjoyed the interview and the Naked books. And a big thanks to all the Hoydens for inviting me to blog here.